Calls are growing to not name the CEOs of Hanjin Group and Lotte Group as executive directors of their key affiliates due to their past illegal activities. 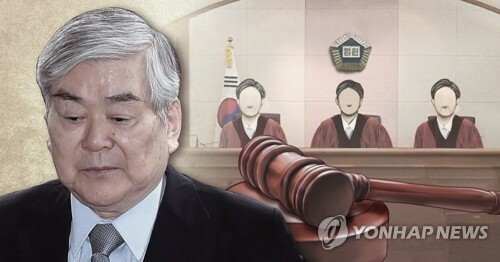 In its report released on Wednesday, the Center for Good Corporate Governance, a local research institute, recommended that shareholders oppose the reappointment of Hanjin Group CEO Cho Yang-ho to be an executive director of Korean Air Lines Co. and of Lotte Group Chairman Shin Dong-bin to the top post at Lotte Chemical Corp.
"Cho is facing trial on eight charges including alleged embezzlement and breach of trust," the research institute said. It also cited Cho's track record of paying family members, taking commissions and other illegal acts as reasons for its opposition to his continued service in the director position. The recommendation is the latest in a series of such calls from civic groups in South Korea as well as major proxy advisory firms including International Shareholder Services. The shareholders meeting of the country's largest airline is due next Wednesday. The CGCG also advised shareholders to stand against the reappointment of Lotte Group Chairman Shin Dong-bin to be an executive director of Lotte Chemical for similar reasons. Shin was convicted of giving bribes to a foundation run by ex-President Park Geun-hye's friend, as he sought favors in winning a government license to run a duty-free business in Seoul. He also got a 20-month prison term in a separate embezzlement and breach of trust case, though the Seoul court suspended the sentence for two years. "Shin not only serves as the chairman of Lotte Chemical, Lotte Confectionary Co. and Lotte Hotel but also in director positions at three other affiliates," the institute said. "Such excessive multiple titles would prevent him from fully carrying out his due duties."